Note: This picnic was originally published on Eat Boutique. I will also point out that I’ve also moved back to Massachusetts as of August 2012 so I’m happy to report that I’ve been enjoying the last remaining vestiges of a “proper” summer. In San Francisco summer as we know it back east is an elusive animal so when a sunny day in June happens on a weekend, especially after many days of mid-week clouds and fog, it’s your solemn duty to take advantage of the opportunity. Our apartment has multiple shared spaces where you can sit outside, catch a few rays, and grill some grub. They’re great spots and amazingly enough you rarely run into anyone else while you’re reading and sipping a glass of wine or sizzling steaks. The balcony on the floor below our apartment contains a very pretty “secret garden” and ample seating for outdoor feasting. 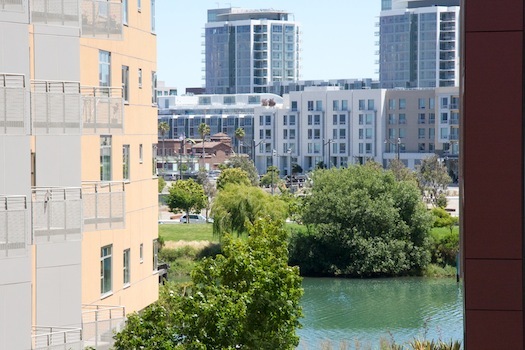 There’s also a peekaboo view of Mission Creek which, two blocks further down, flows into McCovey Cove – home of the Giants and the most beautiful ballpark I’ve ever been to (sorry Fenway!) All-in-all it’s the perfect spot for an urban picnic and affords you very little opportunity to come up with silly excuses about why you shouldn’t gather some ingredients and whip up a warm weather meal. The highlights of our weekend picnic were strawberries and fresh cherries. 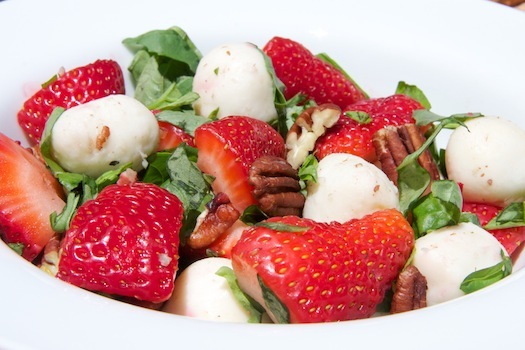 I especially enjoyed the seasonal take on caprese salad which replaced tomatoes with super sweet berries. Plus, I can’t help but point out how much the crostini pieces layered with brie and chocolate looked like elegant (although unintentional) s’mores. An added bonus of the warm weather and bright sun was the cheese and chocolate melting a bit. By the time we ate the crispy pieces of baguette everything was gooey and perfect. Our meal was, admittedly heavy on the pink ingredients so it only seemed appropriate that we washed it all down with a vibrant and refreshing Rose from Naked Wines. 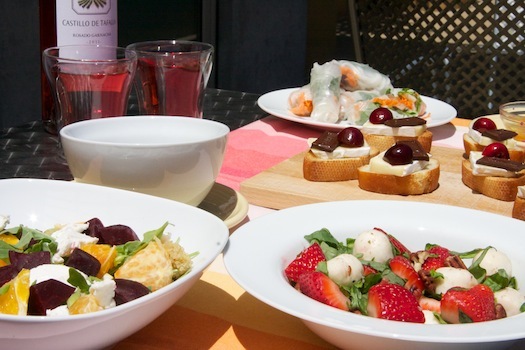 I’m absolutely looking forward to my next sunny afternoon now so I can try out another picnic menu. Please share your favorite dishes with me in the comments. I’d love to hear all of your delicious ideas! Slice cheese to fit baguette toasts and put 1 slice on each toast. Top each with 2 cherry halves and a chocolate curl or square. Combine all of the ingredients and dress with olive oil, balsamic vinegar, and sea salt. Bring water to a boil and cook rice noodles according to package directions. Drain, rinse and cool (makes about 2 cups). Line up ingredients in small bowls before beginning to make rolls. Fill a large bowl or saucepan with very warm water. Place a rice paper round in the hot water. Soak for between 30 seconds and 1 minute, or until rice round is pliable and pattern on the round is barely visible. Remove and place on a clean, slightly damp kitchen towel. Place 2 basil leaves on the inner edge of the rice round, about 1-inch from the edge and leaving about 1-inch on each side. Top with approximately 1/4 cup cooked rice noodles. Place 2 shrimp halves on top. Top with about 2 tablespoons carrots, then 2 leaves of mint. Fold 1 piece of lettuce leaf and place on top of pile. Bring the edge over filling and tuck underneath. As you continue to roll, fold in the sides. 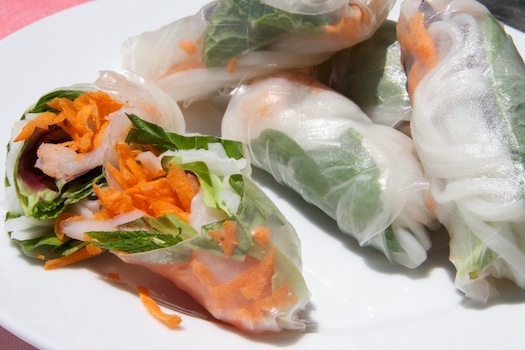 Finish rolling, repeat with the other rolls, and reserve under a damp cloth or paper towel. When ready to serve, slice in half and serve, cut ends up, with dipping sauce. Dissolve sugar in warm water, combine with other ingredients, and chill until ready to use. Your favorite dressing, I usually use a balsamic vinaigrette. On a platter layer the ingredients in the following order: arugula, quinoa, beets, orange segments, goat cheese, and then top with dressing. Serve at room temperature. What a gorgeous gourmet picnic. Did you do all this work just for you and CK? What a cute idea! 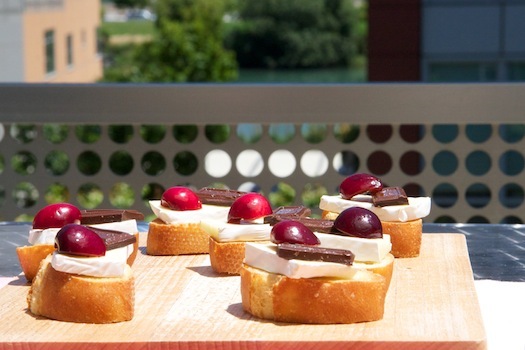 I love the idea of pairing cherries with Brie and chocolate. Yum!